An already crazy night in Vegas continued in the 450 main event. Ryan Dungey took the holeshot and was looking to check out, but he soon had company in Ken Roczen. Despite the fact this race meant very little—other than pride and confidence and bonus money, of course—the two were battling like it was Anaheim 1. Shortly after taking his first lead of the night, Roczen made a huge mistake and went down. Dungey clipped his bike and went down as well. From there it was a mad rush to see who could get up first…. and it was Dungey. Jason Anderson moved into second as Roczen pulled into the mechanics area. Roczen appeared to have a problem with his handlebars and called it a night. Dungey cruised from there to claim his ninth win of the season—the most in a single season. Anderson would take second with Eli Tomac charging back to collect his third straight podium. Chad Reed just edged out Blake Baggett on the final lap to snag fourth. 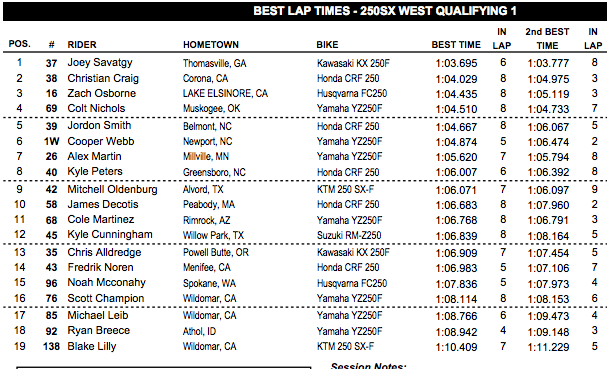 Broc Tickle, Justin Brayton, Trey Canard, Cole Seely and Justin Barcia would round out the top 10. Congrats to everyone on a great season. On to the Lucas Oil Pro Motocross Championship. Dave Coombs East/West Shootout for all the title marbles? In the mud? This is pure filth! And as expected in this slop, a huge first turn broke out, which claimed Jeremy Martin and Shane McElrath, while Joey Savatgy took the lead. 250SX East points leader Malcolm Stewart was in a good spot in third, but Cooper Webb came around in about 15th—and he needed to be 12th with Savatgy leading. On the second lap, Savatgy got cross rutted and almost went down, and Colt Nichols sailed past to take the lead. Savatgy got him back, but then Nichols went right back after him. As they battled, Webb got into 11th but was struggling in the conditions and not moving forward. He was even passed by Martin Davalos to fall into 13th, but Jordon Smith went down, keeping him in 12th, which is key because one more spot would cost him the title. The race was just a survival fest after that. Everyone was rolling around just trying to stay up. Savatgy logged a really clutch ride when he absolutely had to have one, pulling away from Nichols and getting the victory. Nichols made a few mistakes and fell back. Osborne took second and Stewart third, easily giving him the 250SX East championship. Aaron Plessinger was flying after a bad start in the mud and nearly passed Stewart for the final podium spot, but Mookie just edged him. Meanwhile Webb was holding on by his finger nails. He had a huge lead on 13th at one point, and then moved to 11th. On the last lap Mitch Oldenburg made a run and nearly caught him. Webb rolled across the finish line, taking the title by one point. We're 18 weekends and 17 races into Monster Energy Supercross for 2016, and Ryan Dungey already has this year's 450SX title. But the Las Vegas finale is still a unique race. The track is a different animal compared to most others, with super long lap times thanks to that classic Monster Alley section outside the stadium, and gnarly obstacles like the first-ever combination of three-straight dragon backs in a rhythm lane. It's really tough. The whoops are also deep and nasty. Laps won't even get under the one-minute mark tonight so these main events are going to be long. All summed up, this is a totally different deal than most of the races we've seen this year. Hey, it's Las Vegas. Oh and there's the matter of the Dave Coombs Sr. East/West Shootout. Titles are still on the line in both 250SX divisions, and we have all the math done for you here. Malcolm Stewart needs to finish tenth, Cooper Webb needs to finish twelfth. But Webb is dealing with a wrist injury. Now, we pretty much know his wrist is broken, but he's not talking about it, and there seems to be a veil of secrecy over at the Yamalube/Star Racing Yamaha truck. In untimed practice, he was tenth fastest. We'll see how it goes the rest of the day--this certainly isn't an easy track to ride with a bad wrist. The final qualifying practice has been cancelled. The track is shut down and the Dirt Wurx is currently pumping the water off the track. The skies really opened up for a about a half hour and the track is FULL of water. Dirt Wurx has their work cut out for them, but it doesn't look like it is going to rain again so things are looking promising. These guys have done some amazing things to the track in the past, we'll just have to wait until the night show to see how things turn out. With all these mini ponds, we may have to call this one a "pudder." Okay we'll talk about practice in a moment but first this news update: HOLY CRAP IT'S RAINING HARD HERE. Rain started to drop in the waning moments of the seeded 450 practice session, and then the skies really opened just about a minute after the session was complete. The unseeded 450 group was just about to roll out, but they were told to head for the pits and get cover, which was good timing because the rain drops grew huge and then lightning rolled into the area. So now the track is absolutely drenched. It's going to really mess with things tonight, as there is standing water between every jump and whoop and it would be almost impossible to salvage things by the night show. It's going to be a mess tonight, no doubt. 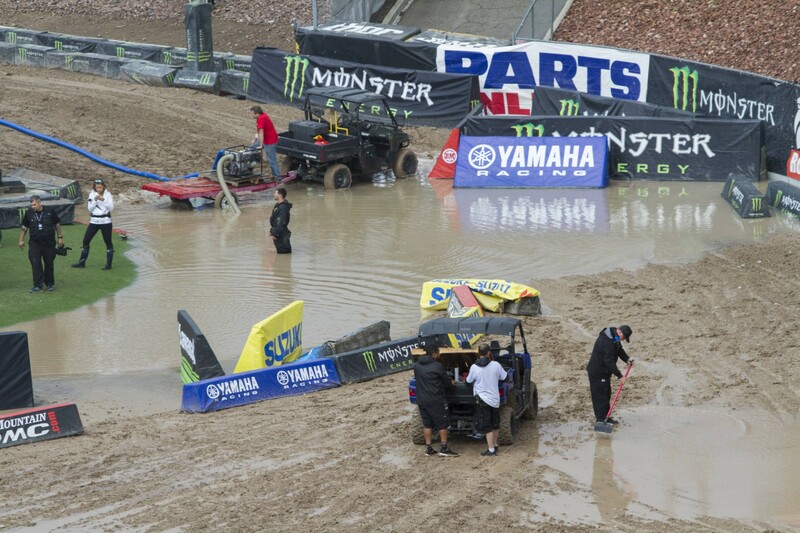 Would you be a little nervous if you had a 250SX Championship to win in these conditions? When practice did run--before it rained--usual suspects were up front. Joey Savatgy hauled the mail in 250SX West, and Cooper Webb, bad wrist and all, was a solid second for most of the session. Eventually some other riders stepped up and Webb ended up sixth fastest. He even cased and flat landed a few jumps along the way and didn't seem to suffer ill effects. So maybe his wrist really is okay. These are the guys who have been up front in 250SX all season, so no surprises. Webb is carrying a sore wrist but looked okay when he logged a few hard laps. 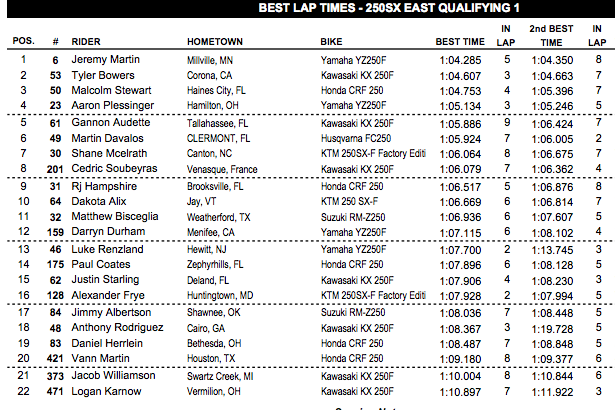 In 250SX East, Jeremy Martin was strong, nailing the three-straight dragon back's quite well. He said after the session that he's way too competitive and his team works way too hard for him not to go for the win tonight. But that was before it was raining so who knows how everyone will attack it in the races. 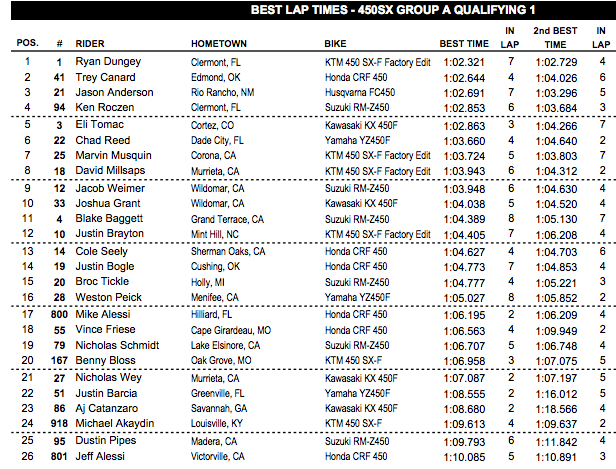 Canard held the top time for awhile until Dungey stole it late. Also Chad Reed looked solid all day, the track has some difficult sections and the TwoTwo is always strong through those.